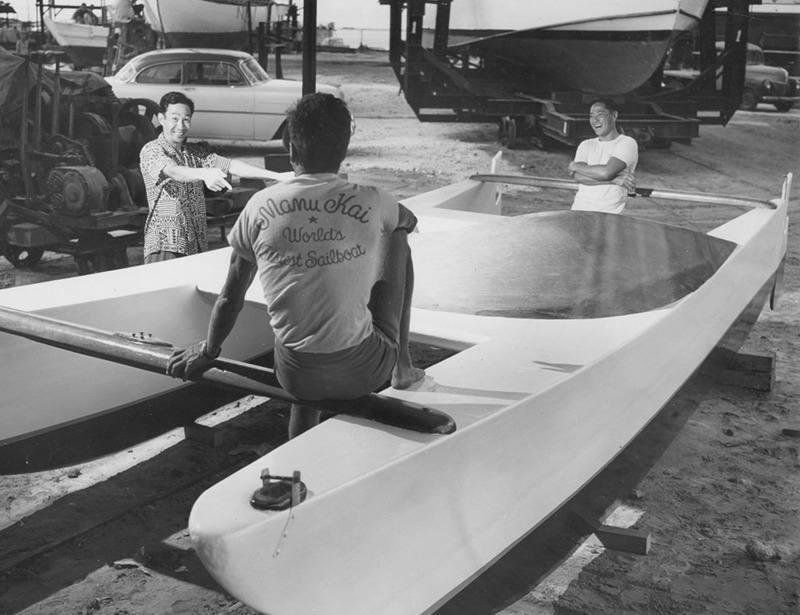 In 1947 Woody Brown, Alfred Kumalae and Rudy Choy built MANUKAI, the first catamaran of the modern era. The inspiration for this revolutionary boat lay in the ancient Polynesian Double-Canoes that had enabled migration to Hawai`i from Tahiti over 1,500 years ago, a time in which Western man was still land-bound. 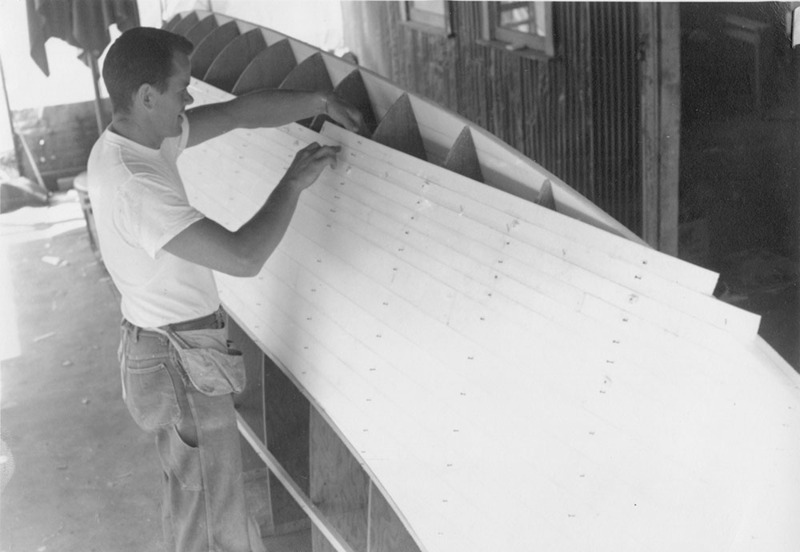 While Woody’s background as a world-champion glider pilot greatly influenced her construction, so that she more closely resembled a lightweight aircraft than a boat, her hull design was influenced by sketches of ancient double canoe cross-sections. Other cats soon followed with equal and greater success, thrilling the adventurous on high-speed reaches off Waikiki Beach. 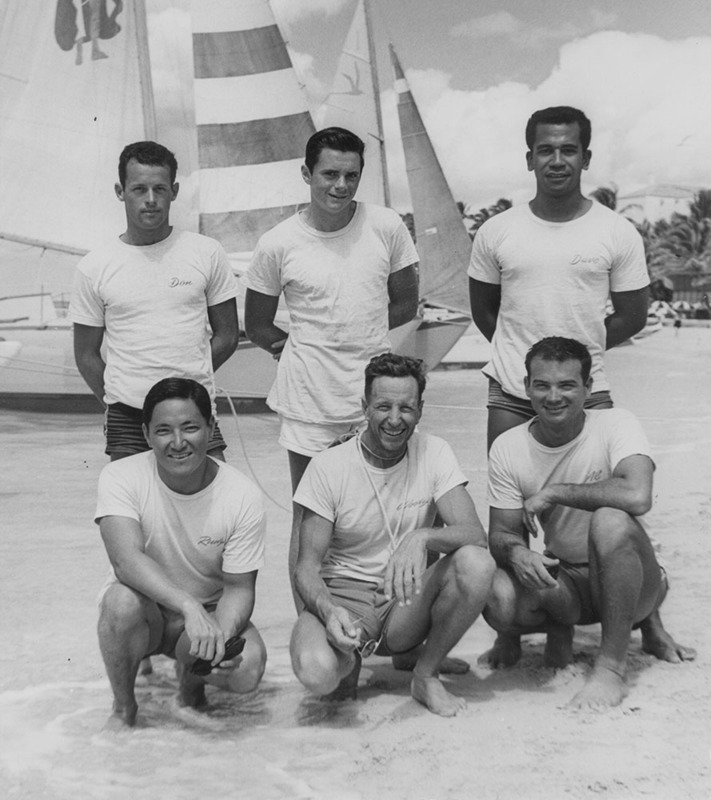 But it was the refusal of the Trans-Pacific Yacht Club to accept WAIKIKI SURF in 1954 Trans-Pacific yacht race from Los Angeles to Honolulu that sparked a determination in Rudy Choy to crusade for his belief that catamarans were the vessel of the future. 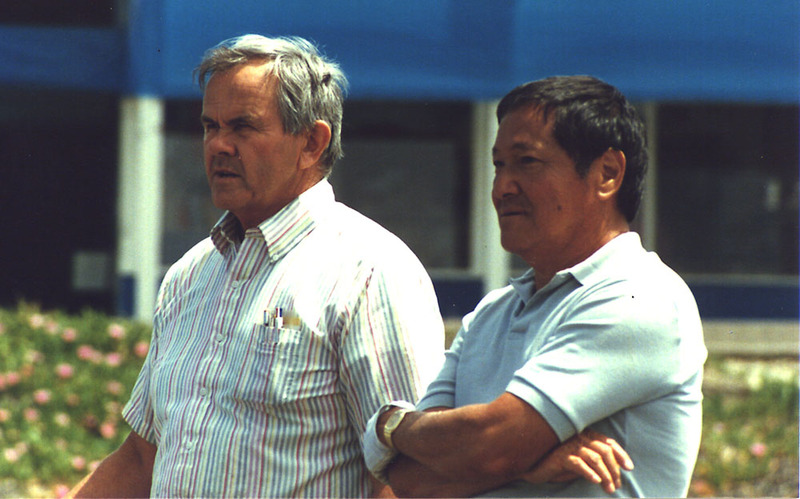 In 1957, with Alfred Kumalae and Warren Seaman, he formed C/S/K Catamarans. 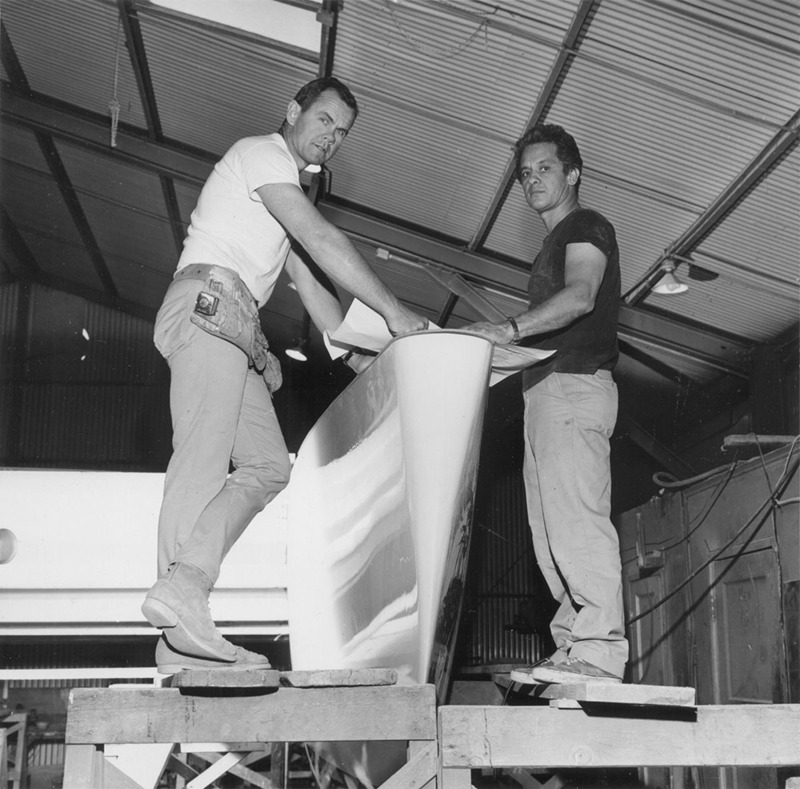 The partnership, joined by Vince Bartolone in the early 1960’s, was responsible for some of the fastest and most innovative catamarans ever created. The early 1960’s were truly the dawn of the multihull era. The firm was fortunate in attracting the interest of many conventional yachtsmen who, in defiance of the rigid, stodgy tradition of conventional yachting, were intrigued enough in the raw performance of the early cats to pioneer a new generation of race boat. Men such as Ken Murphy, Jack Swart, Dr. Jack Pursell, and James Arness (Marshall Dillon of T.V.’s GUNSMOKE) sparked the competitive spirit and creative energies of the partnership, leading to a series of ocean racers that dominated West Coast racing for decades. Even the 35’ length-overall POLYNESIAN CONCEPT, built for Buddy Ebsen of BEVERLY HILLBILLIES fame was capable of high performance, capturing First-Corrected time in the ORCA (Ocean Racing Catamaran Association) 1968 Transpac, finishing second only to the C/S/K designed SEASMOKE, a 54-footer. Without question C/S/K’s passion was designing and building ocean racers. Yet, the majority of the its projects were cruising catamarans. LANIKAI, which was built in 1962 for Martin Crumrine, was perhaps the first true cruising catamaran on a par with the finer conventional cruising monohulls of the day. WORLD CAT, launched in 1965, became the first modern catamaran to circumnavigate the globe. Lessons learned from her formed basic principles that are followed by Choydesign – namely that even with the construction of cruising boats weight is a consideration in order to maximize performance in the ocean, and that the accommodations plan, particularly, should be created to maximize utility at sea, not just when docked or at the mooring. Testimony to the soundness of this approach can be found in the fact that many of these cats are still sailing actively today, including LANIKAI, IMILOA, BANTU, PAPA NUI (renamed MOANA PUA), ANTIGONE, and KENUMEMA, to name just a few. As the decade of the ‘60’s drew to a close, the State of California underwent a severe recession. Homesick for Hawai`i and desiring to test the waters in the tourism arena, in 1969 Rudy launched AIKANE CATAMARANS, with the original AIKANE at Laurance Rockefeller’s pioneering ‘Mega Resort,’ the Mauna Kea Beach Hotel. Within a year, the fledgling company began the very first boating operation at Ka`anapali, Maui, launching what is, today, a multimillion dollar industry with operations at all the major resort destinations. Shortly thereafter, operations in Honolulu began, culminating with a five boat fleet carrying over one thousand passengers daily on snorkel/swim trips, dinner cruises and custom evening charters. During the AIKANE years up to the present, Rudy never gave up on his first love – designing and sailing ocean-going catamarans: a part-time project started in 1983 literally in the back yard of the Topanga Canyon home of partner and lifelong friend Warren Seaman and assisted by Vince Bartolone and many others, was to enable Rudy to fulfill his life’s dream: to own the Trans Pacific elapsed-time record. When, in 1989, the 62-ft. AIKANE X5 sailed across the finish line at Diamond Head 6 days and 22 hours after leaving Los Angeles, she was the sixth catamaran to bear that name. She was also the last collaborative design effort of C/S/K. The years leading up to her record were punctuated by some unforgettable creative opportunities, and perhaps, some of our best work. We were also blessed by the friendship, creativity and steadfast support of many people, friends both old and new. It is not without irony that a project that sparked a revamping of all our hull designs was traceable, in lineage, to Ancient Polynesia of over 1,500 years ago. In 1974 Rudy met with artist Herb Kane, University of Hawai’i Professor Ben Finney, and well-known Hawai’i waterman Tommy Holmes. Together, they sought to prove that, contrary to the theory expounded by Thor Heyerdahl that the Polynesians had drifted by chance to landfall from the East, the Polynesians were capable of, and had indeed, sailed from the ancestral lands in Tahiti to what is today known as Hawai’i, navigating by the stars. They envisioned a modern replica of an ancient Polynesian Double-Canoe, but lacked the expertise to design and build one. Rudy created the lines and Warren began the construction of the 60-ft. long HOKULE’A, which not only succeeded in sailing to Tahiti and back without the use of modern navigation or instruments, but would transit all of Polynesia three times, covering tens of thousands of miles at sea, and most recently returned from a historic voyage to Rapa Nui (Easter Island). One of our most rewarding projects (and enduring successes) was the creation of the first luxury commercial passenger cat for Developer Chris Hemmeters’ famed Hyatt Regency Maui at Ka’anapali in 1979. Chris’ only instruction with regard to her design was that she was to match, in every respect, the elegance and uniqueness of the resort. Except for this dictum, the design and construction details were left entirely to Rudy, Warren and Vince and Master Boat Builder Gilbert Iwamoto. Today, some twenty one years after she sailed up to the anchorage fronting the Hyatt Regency, KIELE V, named in Hawai’ian for Hemmeters’ daughter, Kelly, remains a perennial favorite of hotel guests and is sold-out days in advance, year-round. We were again fortunate to work with Chris in 1990, who bought-into the idea of an ultimate-thrills racing catamaran for his $350 million Kaua’i Lagoons Resort on the Island of Kaua’i. She was to be capable of providing the thrills of a 60-ft. racer, but with a load of paying passengers while still meeting burdensome U.S. Coast Guard regulations. To add to the challenge, the boat would be operating in steady trade winds in excess of twenty-five knots for much of the year. At an overall length of forty-four feet, KIELE VI had a beam of twenty-eight feet – only three feet narrower than AIKANE X5, a sixty-footer. Despite the harrowing conditions at Nawiliwili, from where she operated, KIELE VI was granted a 25 Mile license-at the time, the longest route for a boat of her size in the State and a testament to her seaworthiness. With her Randy Smyth-designed wing mast and sail plan and extra-wide beam, even in twenty-five knot winds she was exceptionally stiff and could be steered with one finger. Sadly, in 1992, after only two years of operation, KIELE VI was totally destroyed in Hurricane Iniki. Meanwhile, back in Honolulu, during over two decades, from 1970 to 1990, Aikane Catamarans was highly profitable, carrying over 250,000 passengers annually with revenues of over $4 million. Our dinner cruise operation was the “mistress” that prevented our involvement in design projects and for much of the time we considered only our own vessels, the last of which were each over ninety-five feet in length; planned future vessels were over 120 feet in length. But the beginning of the Gulf War launched the State of Hawai’i, almost solely dependent upon tourism, into a recession that still lingers and caused a chain reaction throughout the visitor industry that forced the eventual closing of Aikane. Today, the worldwide recognition of multihulls as outstanding platforms for the widest imaginable applications inspires Choydesign to apply over a half-century of experience in their design, construction, and operation, whether as private yachts, commercial passenger vessels or racing record-setters.